A couple of interesting things to say today, first of all is that I woke up this morning and needed a pee and a drink and thought ‘I must be sugary’, I went to the lavatory and then grabbed a swift drink then did a blood test. I was surprised by this partly because it isn’t very high and partly because I think it is an indicator that my sensitivity to anomalous blood sugars is obviously getting stronger, e.g. 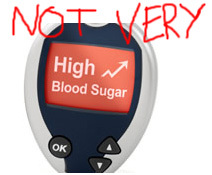 I am noticing feeling low/sugary more because I am between “normal limits” for more of the time. This is excellent because it means that heading onwards and as I get my blood sugar under even better control that I should be able to figure out much earlier if I am rising or dropping and therefore need a bolus or something to eat. Second thing is that I am doing another lot of fasting blood glucose tests this afternoon! I’ve been hanging about the 8mmol/l mark since I started but I suspect another drop is headed in my direction before the last test at 6pm. I’ll let you know tomorrow.